Update 2017: Shout out to Olivia! 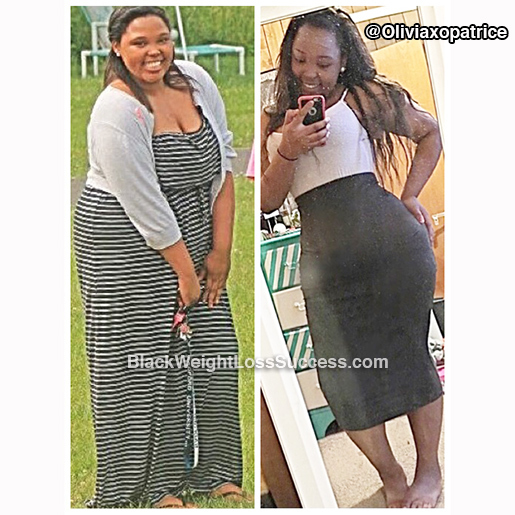 She’s lost over 100 pounds. Update 2016 : Olivia wrote in to update us on her progress. She’s lost 18 more pounds for a total of 78 lbs gone. Check out her story. I was tagged in a candid photo (before photo) by my cousin and was shocked how I looked. I was tired of making excuses as to why I couldn’t live a healthier lifestyle and not feeling beautiful or comfortable in my own body. I changed my mindset and started to surround myself with uplifting supporters on my journey. I get inspired knowing that I can inspire others to reach their goals by not giving up. I’m 22 lbs from my big goal of 100 lbs total pounds lost! I’ve eliminated sugary, fried and processed foods from my eating habits. I started eating more veggies, more grilled/baked meats and more fruits. I’ve made healthier food choices overall. My workouts consist of spin class 3 times a week and 3 mile walks 5-6 times a week. I strive to reach 10,000 steps a day no matter what I’m doing. To others, I say trust the process and give it your all! Great things never came from comfort zones. Step out of your comfort zone and take it day by day. You are only capable to what you put your mind to, so speak it into existence. Let your actions speak louder than your words and remember why you started. The journey is not easy but it’s worth it! Hi! 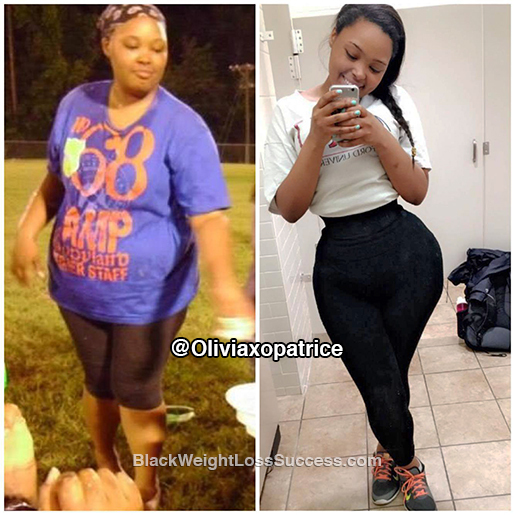 My name is Olivia My motivation to lose weight was to get healthy and be comfortable in my own body. Growing up, I’ve always been a bigger girl and I felt that it was time to finally do something about what’s making me unhappy. I was inspired by the many women featured on the BWLW page and wanted to make a change myself! I changed my eating habits by meal prepping everyday and eating healthier food options. My eating habits went from a diet change to a lifestyle and now I enjoy what I eat. I stopped eating bread, pasta, soda, processed and fried foods. I started eating more vegetables, fruits and lean meats. I try to have greens every day. Protein wise, eggs and grilled/baked meats are my main go-to. I actually didn’t eat pasta at all (It wasn’t the easiest to give up). Now, I eat pasta here and there in, moderation. I eat carbs but in low amounts. I would snack on low carb foods, like pepperoni, string cheese, etc., throughout the day. I did cycling every day at the gym and a lot of intense cardio (elliptical in intervals, treadmill, running and the stair master) for an hour a day. My starting weight was 255 pounds in May 2015 and my current weight is 195 pounds (as of October). I’m 5’5″. I started my weight loss journey at the end of May (the last week) so it’s been about 5 months exactly now. My advice to others who wants to change their lifestyle is to stay motivated. Surround yourself with positive reinforcement and know that you have an end goal to reach. Remind yourself of why you started and keep pushing until you get to your goal.